Scoliosis is one of the more severe types of misalignment patterns that we see in our chiropractic centers. 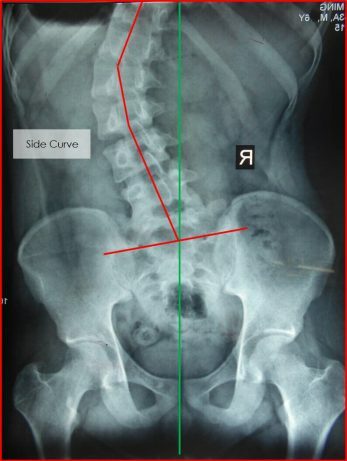 Scoliosis is defined as an abnormal side curvature of the spine when one views the spine from behind. 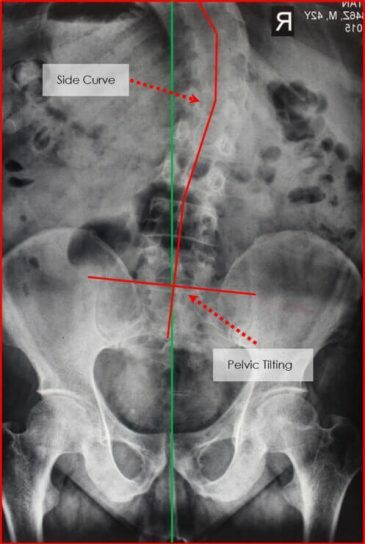 From behind, this person’s spine should be straight, as represented by the green line, and their pelvis should be level. You can see how their low back (lumbar spine) is curved towards the right, and their pelvis is tilted downwards on the right side as well. This type of misalignment is very severe as it will lead to a high degree of stress to this person’s nerve system in the lumbar region. Interference to the nervous system is why scoliosis is so serious. This person’s muscles will become tight, stiff, and likely ache when they are under stress. Their posture most likely will be visibly distorted. Usually, we will see an obvious imbalance in this person’s shoulders and a rotation or some kind of distortion in their pelvis. Their walking (known as gait) may be altered as they are compensating for the significant misalignment in their lumbar spine. It is possible that one could even see this type of spine distortion with the naked eye through their clothing. As with most types of health problems, the earlier we can catch scoliosis the better the outcome. This is another reason why children are the best people for chiropractic care: we have the greatest opportunity to make a positive impact in their lives if we catch a small problem before it becomes a major crisis. If we can catch a spinal distortion like scoliosis at a young enough age often the goal is to complete correction of the misalignment. Many types of scoliosis are reversible if caught early enough and addressed properly. 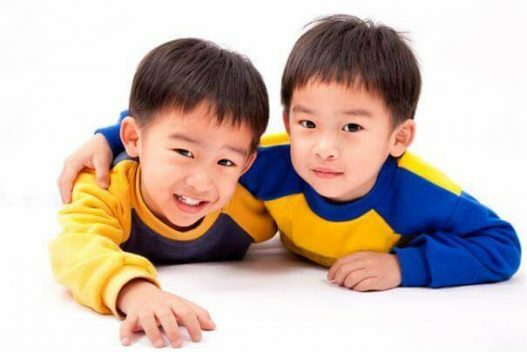 Even we are unable to catch the problem in childhood, it is still very likely we can make improvements with natural chiropractic care. 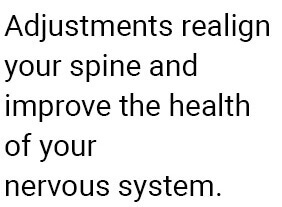 For difficult cases, the goal may be to stop the misalignment from worsening, and to improve as much function in the spinal region as possible. This can still lead to a major improvement in the person’s health. The only way to determine if chiropractic is the right approach for a particular case of scoliosis is to have your spine thoroughly examined by a qualified Doctor of Chiropractic. Doctors of Chiropractic are the only healthcare providers that specialize in correcting spinal misalignments, known as subluxations. Again, scoliosis is a type of subluxation. Scoliosis can be a challenging pattern of misalignment to correct. Everybody has a different healing process, so results are highly individualized. We have had a lot of success with scoliosis over the years, but we have to thoroughly examine your spine before discussing recommendations, goals and expectations. Stop suffering from health challenges, improve your spine alignment and restore your vitality with natural chiropractic care.